Ten sites including job centres in Wales are to merge or close, the Department for Work and Pensions says. 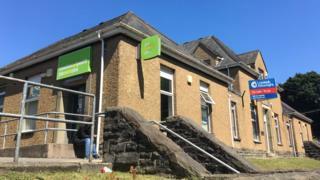 Its service centre in Llanelli will shut as will three job centres at Pyle in Bridgend, Mountain Ash in Rhondda Cynon Taff and Tredegar, Blaenau Gwent. Plaid Cymru AM Simon Thomas said the move would result in the loss of 146 jobs in the Carmarthenshire town. The DWP said all staff are being offered the opportunity to relocate to other sites. Mr Thomas, who represents mid and west Wales, said the decision would have a "huge impact" on Llanelli. "The spin-off in terms of the local economy has been overlooked by the Conservative government in Westminster," he said. "Once again they look just at the spreadsheet economy, rather than how we can start to re-build our communities after austerity." Eight sites - including job centres at Pyle, Mountain Ash and Tredegar - will close. Work at the Aberystwyth office in a former school building will move into a job centre in the town. Haverfordwest Winch Lane Surgery health and disability team will move to the town's job centre. Llanelli Crown Buildings are to close permanently. Aldway House in Porth will close with work moving to Tonypandy. Work at St David's House in Newtown, Powys, will move into Newtown job centre. Job centres in Ystradgynlais, Newtown and Llandrindod Wells, which were earmarked for closure, will stay open. Two other sites are still under negotiation. The DWP said the reorganisation was not about cutting jobs but "delivering a more efficient and modern employment service". All staff are being offered the opportunity to relocate to other sites and anyone who does not want to relocate will be offered a redundancy package. UK Employment Minister Damian Hinds said: "We will always make sure that people have the support they need to get into and progress within work. "These changes reflect the fact that more people access their benefits online resulting in many of our buildings being underused. "We're merging some offices and locating other jobcentres with local authorities to make sure that the welfare state and our employment support works for those who need it and those who pay for it." But the PCS union said the move would "decimate services to the public". Wales chairwoman Katrine Williams said: "The DWP should not be removing jobs and services from areas of high unemployment and threatening our members with the risk of redundancy. "There is a massive amount of work and support that we need to deliver to the public and the best way to do this is with sites and our members based in the local communities."